Home is a box on Coppermill Lane, caught in the crosshairs of Walthamstow High Street and Blackhorse Road. It’s a one-bed flat on two floors, too small to live alone in. Two people generate less clutter than one: with someone else about, we have a reason to live neatly. We supervise each other. My current supervisor is Henry, a playwright tending bar at a small fringe theatre. He’s been there a week. On his first shift, the manager slapped him energetically on the rump before announcing, in a tone of reverential awe, “He’s so slim! Look at his slim hips!” The manager was, in her defence, quite drunk. That was Tuesday. Henry is a calm and benevolent presence. He keeps me sane and washes the dishes. For a year, I didn’t live here. Instead, I sub-let the flat to Sophie. She was my ex-girlfriend at the time, and remains my ex-girlfriend to this day. I had no real objection to living with her, but chose instead to relocate to Scotland. We are still on very good terms. Before Sophie moved in, I moved out. Before I moved out, I lived with Zoah. I haven’t mentioned Zoah yet, but I’ll tell you about her later. Until then, you’d better put on a coat. To chuse a proper coat for winter’s wear. It’s not a very good poem, but Gay does know a thing or two about coats. He goes on to explain, at length, the difference between various cuts and cloths. In short: aim for something heavy, dark and above all water-resistant. Mine is a US Navy standard issue peacoat, which does the job nicely, and keeps London from trickling down my collar. Grab your own, and we’ll head out the door. There. The high street up ahead, and Blackhorse Road to your left. Walthamstow High Street is, as the tourist office will tell you, Europe’s longest street market. Veg aside, most things seem to cost five pounds, regardless of size or inherent value. I love it here. If you get up early enough, you can watch the white stalls bloom like mushrooms all the way up the hill and out of sight. One of the regular weekend stalls sells cables – and only cables – in a plastic tub: unpackaged, unlabelled, a seething Gordean knot of cordage. Wires for phones, for modems, for power drills, for an electric typewriter and an electric toothbrush, all writhing together like a bucket of copulating eels. Still thinking of eels, we cross the road to L MANZE, a real unmitigated pie’n’mash shop. The hot eels and liquor are worth noting, but today we have come for fruit pie and coffee, the latter at £1.15 a mug. I’m not sure what the L stands for. Our waitress has been working at L MANZE since the Berlin Wall fell. Catch her eye, and ask her. The newer cafes over in Walthamstow Village are trendy, tasteful and affected, but those beside the market remain unselfconsciously weird. If you’re in the mood for Louis Quatorze, there’s Ricco’s, where everything not gilded has been smothered in crushed velvet. For a solid fry-up, it has to be Jesse’s. I eat Jesse’s ‘Sunshine Special’ every other week. From here, a 25-minute trek will take you to the Ravenswood Industrial Estate, where we find God’s Own Junkyard – a temple to electric light, complete with its own gun-toting 60 watt Jesus. 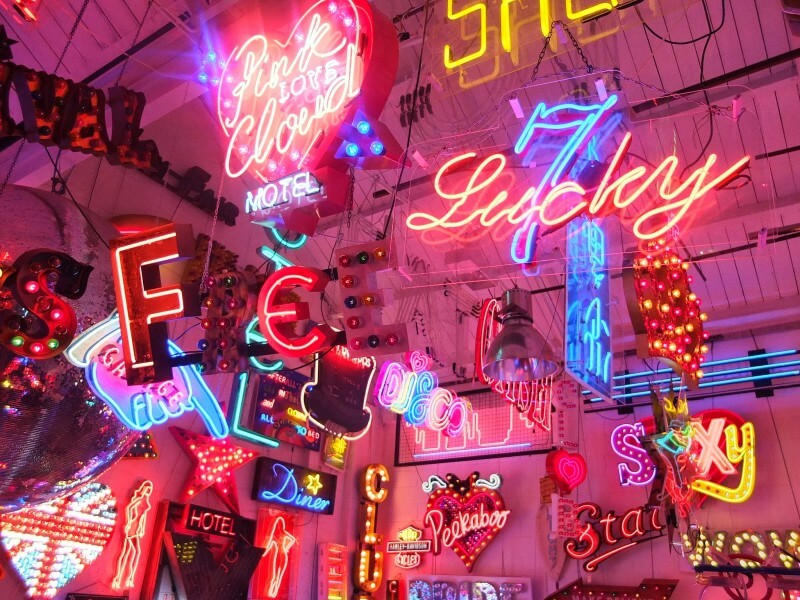 It was the life’s work of Chris Bracey, London’s king of neon. His art illuminates countless Soho doorways, but he saved the best of it for this cavernous space in E17. Lorraine Mariner wrote a fine poem about the Junkyard in her most recent book, There Will Be No More Nonsense (Picador, 2014). Mariner works, as it happens, at the Southbank Centre’s poetry library, another place of beauty, strangeness and light. If you’re not in the mood for strip-lights, a 25-minute walk in the opposite direction will bring you to the Walthamstow marshes, a national park of sorts, studded with pylons. It’s brilliantly overgrown, a plot of medieval lammas land that remains unowned and untamed. It’s home to sedge marsh, sallow scrub, and other types of indistinguishable foliage. Like many Londoners, my knowledge of botany covers only two species: ‘grass’ and ‘tree’. Anything else is probably poisonous. And yet, for some reason, the marsh keeps drawing me back. Be careful: if you follow that twisting, leafy path to the right, it’ll take you a week to find your way back out again. We could ignore both nature and neon, and take a stroll down Blackhorse Road – but why would we? There’s nothing: a school, houses, a petrol station. When I first moved to Walthamstow, the petrol station was in limbo. A sign, written in felt-tip on cardboard, NO PETROL, was propped in the window for over a year. On the forecourt, the aging cash machine had its own version: NO CASH. Opposite Blackhorse Road tube station is a mural – another of Chris Bracey’s works, one of his last, finished just four months before his death from cancer in 2014. It says ‘The Home Of People Who Make And Create’. I don’t know how to feel about it. It’s a lot to live up to; I can’t yet convince myself that I fall into either category. Above the words is an enormous sequined heart. Below them, two flat men in high-vis jackets are being industrious with paint. According to the Waltham Forest Guardian, the mural has a ‘life-expectancy’ of twenty years. There’s still time. It’s nice to play the role of tour-guide for a while. When I first moved to London, I played the hawker. For a few months at a time, between doses of university, I sold luxury teas to tourists from half a dozen market stalls: Portobello Road, Camden Lock, Spitalfields . . . It’s good, enjoyable work, if you don’t mind ten hours a day standing up. The couple who hired me, Canadian Sean and Chinese Trinh, worked from a warehouse in Camden where, between them, they looked after every aspect of the tea-selling business except packaging. Packaging, Sean told me, was his mother-in-law’s job. Dragging back a crate of unsold rooibos at night, I would occasionally see her there, stooped over hundreds of brown paper packets, humming under her breath. Did she ever get tired, I asked her once. She thought for a moment, choosing the words: No. No, because she is very proud of both Sean and Trinh. Sean is a good boy. I agreed, and she went back to packing tea. Two summers later I found myself back in Camden, working just a minute’s walk from the tea warehouse, at the combined offices of the Camden New Journal, Islington Tribune and West End Extra. Strictly speaking, only the Journal has an office. The Tribune is a kind of immobile mobile home, wheelless in their back garden. West End Extra, if I remember correctly, is a folding plastic desk. The Journal was co-founded by Paul Foot, and his belief in dogged, campaigning journalism still drives their ethos. I spent most of my short time there looking for news, and failing to find any. That summer ended with an emergency recall of parliament, to debate whether or not we should drop bombs on Assad’s Syria. Back then, things seemed more clear-cut. I knew nothing at all about Syria, but I was wearing a tie, had good, strong shoes, and was only taking up much-needed space in the office, so I sent myself out to cover the demonstrations at Downing Street, texting back notes and pictures from my phone. It was a print day, and we needed something for the Tribune’s page five. As luck would have it, North Islington’s back-bench MP was leading the protest, speaking from a podium above a tower of scaffolding. Desperate for good photos, I clambered up the scaffold, nearly falling off and breaking my leg. At the time, I was more worried about breaking my borrowed camera. A couple of national papers were still hanging around after his speech, hoping for an exclusive soundbite. Did the MP think that the – ? No, no comment. He had said all he needed to say. I played my trump card: Islington Tribune, I yelled. Does Mr Corbyn have time to talk to his constituents? He did, and we got our page five. I would never have ended up in journalism if it weren’t for Zoah. She has presence. At 5’9” she is still, somehow, always the tallest person in the room. Back at university, I started work on the student newspaper where she was Associate Editor. I was a disorganised, flustered fresher, and she took me under her wing. Zoah remains a kind of honorary uncle in my life, on hand with whisky and cigars whenever things take a turn for the worse. After university, we spent a summer sharing the Coppermill Lane flat, alternating between her on the bed and me on the sofa, or vice versa. Zoah had night-shifts at The Times and I sold tea during the day, which worked out well: if it was my turn for the sofa, but I was planning to invite company home, she would always be around to swap over the bedsheets and tactfully disappear (and I would always return the favour). Like most of my friends in London, I met Zoah elsewhere. A truism: it’s difficult to meet new people here, but easy to meet new kinds of people. The first two friends I actually met in London were a pair of middle-aged goths called Paul and Ian. Paul was, at one stage, the frontman of a moderately successful new-wave band who still enjoy a degree of popularity in Denmark. They perform on the cabaret circuit as The Antipoet: Ian plays double bass while Paul recites his wickedly funny verses, occasionally accompanying himself on the triangle or cowbell. Under the warm, patient guidance of Paul’s wife, Donna, they host words-and-music nights around London. Three of the kindest people you could meet, they gave me my first ever poetry gig, and for that I will always be grateful. In London, the world is full. Over the past few months I’ve been to a mime show and a fetish night, an abstract art exhibition and a chess-boxing tournament. On other nights, I’ve spent hours staring at the living-room wall, too tired to leave the flat. It’s a nice wall, a feature-wall, halfway between blood and terracotta (I painted it myself). I have dropped out of touch with several close friends, and dropped back in touch with a few of them. I have even met someone who, inexplicably, seems to find me attractive. This city is full, over filled, weighed down with the sheer, unstable variety of life. I wouldn’t have it any other way. Tristram Fane Saunders is a poet, journalist and director. His most recent chapbook, Postcards from Sulpicia (Tapsalteerie, 2015), is an illustrated translation of the complete surviving works of Ancient Rome’s only extant female poet. He works on the culture desk of The Telegraph. 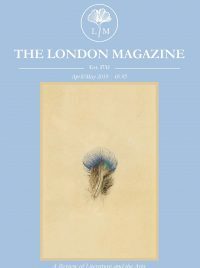 This is the 16th article in our regular series “My London”.